FOWR membership is invaluable because you help keep us strong. Your support helps us defend the Wekiva and educate future generations who will need to take up the work of ensuring this remains one of Central Florida’s environmental jewels. Friends of Wekiva River depends upon the income received from annual dues to sustain its many important activities related to protection of the river and basin. Through our efforts, we seek to minimize impacts from fragmentation and loss of habitat, declines in spring flow and degradation of water quality. Your dues cover administrative expenses, such as paying the rental fee for monthly meetings and insurance for the activities that we lead. Your fees are also critical to programs we sponsor, such as educational materials and research we fund on wildlife and water quality in the basin. Please click on the following link and renew your membership for 2018-2019. The Wekiva River and the wildlife who live within the basin are depending on you!!! FOWR Board: Who are they? What do they do? After organizing informally in 1978 and incorporating in 1982, The Friends of Wekiva River, Inc. began with 19 members and an even smaller number sitting on the Board of Directors. Over the 40 years that have ensued, FOWR has grown to more than 300 members residing in Orange, Seminole and Lake Counties. With the most recent election conducted at the Board of Directors meeting held on May 3rd, the Board now consists of 18 members each serving three-year terms, governed by a President, Vice President, Treasurer and Secretary. We will be launching a series of articles in upcoming newsletters to “spotlight” and introduce each of our Directors to you, but for now we thought you might be interested in some general information about the current make-up of the Board, the different areas of expertise the Board members contribute to FOWR and its mandate, and some of the activities the Board has contributed to and is currently involved in. Most of the Board members have lived in the Wekiva basin for many years, and several were intimately involved with obtaining designation of the river many years ago as an Outstanding Florida Water, a Florida Canoe Trail, an Aquatic Preserve, and a Wild and Scenic River. In addition to the knowledge acquired over the years from these and other activities, many of the Board members contribute technical expertise in areas relevant to protection of the river, including law, biology, engineering, landscape architecture and media. Board members are actively engaged in programs related to water quality enhancement, black bear research, land acquisition in the Wekiva to Ocala corridor and assuring design standards for the Wekiva Parkway. We monitor and analyze projects proposed for development within the basin as well as changes proposed to local government development codes and comprehensive plans that could negatively impact the river and basin. We appear at public hearings before local government boards to advocate for the river, and participate in many hands-on projects throughout the year preparing data and analysis related to species and habitat protection, water quality issues and education. Two of Central Florida’s crown jewels, Wekiwa and Rock Springs, are in danger, and a plan meant to save them is woefully insufficient. It is well known that both springs, as well as Rock Springs Run and the Wekiva River, are suffering from high levels of nitrates and phosphorus that are causing an imbalance in the aquatic plant and animal communities, according to the Florida Department of Environmental Protection. These nutrients have led to growth of nuisance algae and other undesirable aquatic species that are choking out vegetation that fish and other wildlife need to live. In 2008, FDEP determined that nitrate concentrations should be less than 0.286 milligrams per liter to protect the water quality of the two springs and their runs. But the nitrate levels in Wekiwa Springs average about 3 to 4 times higher. In Rock Springs, the nitrate concentration is even higher, averaging between 4 to 5 times what DEP says it should be. In 2016, the Florida Legislature passed the Florida Springs and Aquifer Protection Act which requires development of plans to protect water quality in outstanding Florida springs. These are called Basin Management Action Plans or BMAPs. The Act requires that FDEP develop strategies to reduce pollutants so that the water quality in the springs and their runs will meet the required nitrogen levels. FDEP recently issued the draft Wekiwa Spring and Rock Springs BMAP, which identifies fertilizers and septic tanks within the Wekiva Basin as the major contributors of nitrogen to groundwater that reaches Wekiwa and Rock Springs. The BMAP estimated that approximately one million pounds of nitrogen reach the groundwater within the Wekiva Basin each year. Of that total, approximately 29% comes from septic tanks, 26% from urban turfgrass fertilizer, another 23% from sports turf fertilizer, agriculture and livestock wastes, and about 16% from wastewater treatment plants. The draft BMAP is set to be finalized this summer. But it recommends that nitrogen loads to groundwater within the Wekiva Basin be reduced by only about 20 percent. – certainly not sufficient to reduce the nitrogen concentrations in the springs by more than the needed 70 – 80 percent. 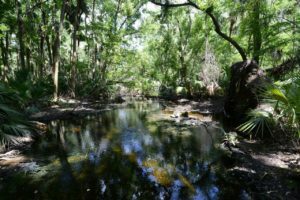 The Friends of the Wekiva River believe that the draft BMAP must provide more specific requirements for reducing nitrogen loads to groundwater from septic tanks, fertilizers and wastewater treatment facilities by at least 80 percent. The draft BMAP would allow new septic tanks to be installed within an area designated as the Wekiva Basin Priority Focus Area – if the permit applicant can demonstrate that “sewer connection will be available within 5 years.” (Note: the draft BMAP does not specify that connection to the sewer is required, only that sewer be available). Existing septic tanks within the Priority Focus Area on lots less than an acre would be required to be either connected to a sewer system or upgraded to provide “enhanced” nitrogen removal within 20 years from the date of the BMAP adoption. Friends of the Wekiva River urged FDEP to prohibit any new conventional septic tanks within the Priority Focus Area to prevent any additional nitrogen loads to groundwater. The Friends also urged FDEP to require “high level nitrogen removal” (removing at least 90% of the nitrogen in septic tank effluent) for new septic tanks and existing septic tanks where sewers cannot be installed within the next 15 years. The Friends also believe that local utilities should undertake sewer construction projects within the Priority Focus Area to eliminate septic tanks in places where groundwater is vulnerable to nitrogen pollution, as identified by the Florida Geologic Survey. The Friends believe that Orange and Seminole counties and Apopka should extend sewer service to existing homes within the areas designated by the FGS as vulnerable and more vulnerable to groundwater contamination. The Friends believe that the draft BMAP should require limits on fertilizer use within the springshed. At a minimum, the draft BMAP should include the following recommendations: Allow only slow-release organic nitrogen fertilizers to be sold within Orange, Seminole and Lake counties; prohibit fertilizer application during the rainy season; ban fertilizer sales within the three-county area during the summer months; establish application rates for lawns in residential and commercial areas; prohibit fertilizer application within 10 feet of water bodies, ponds, wetlands or sinkholes; make local code enforcement officials responsible for enforcing fertilizer ordinances; enforce limits on disposal of grass clippings and debris; and require public education programs on fertilization within the three counties. The Springs and Aquifer Protection Act prohibits new wastewater treatment facilities with permitted capacities greater than 100,000 gallons per day within the Priority Focus Area, unless the facilities reduce nitrogen in their effluent to 3 milligrams per liter or less. The Friends recommend that no new treatment facilities of any size be permitted within the springshed. Further, the Friends recommends that all existing wastewater treatment facilities in the springshed using percolation ponds or rapid infiltration basins – both of which allow wastewater to slowly seep into the ground — should be connected to sewer or provide treatment to limit effluent nitrogen concentrations to 3 milligrams per liter or less. The Friends are deeply concerned the draft BMAP recommendations won’t meet FDEP’s nutrient criteria for Wekiwa and Rock Springs. The Friends believe that more stringent limits on discharges of nitrogen from new and existing septic tanks and more stringent limits on use of fertilizers and wastewater treatment facilities are needed. The FDEP should rethink these issues before the plan becomes final and step up for Florida’s future. FDEP has already committed $50 million per year for springs restoration statewide. The Friends recognize that even more money will be needed to get the job done. The Friends will work with our FDEP and our elected representatives toward obtaining more funding so that the Legislature’s goal of restoring our springs can be met within the 20-year goal. Cleaning up our springs will take collaboration, cooperation, concessions and additional funding. But if we don’t act now, future generations could be robbed of the crown jewels we failed to protect. Friends of the Wekiva River recently applied for, and received, from the Art and Phyllis Grindle Foundation a generous $4,980 grant to fund the continuation of an investigation of the filamentous blue-green algae, Lyngbya wollei, found in the Wekiva River basin. This algae has been a source of concern due to the rise in nutrient levels in the Wekiva River that have increased significantly over the years. Nitrogen and phosphorus are two nutrients of concern in the Wekiva River stemming from sources such as septic tanks, wastewater treatment facilities, and urban, farm and sports turf fertilizers from lands within the Wekiva basin. The proliferation of algae and exotic plants is a result of nutrient enrichment and can have the effect of choking out beneficial native plant species. In 2008, the Florida Department of Environmental Protection set pollution limits for nitrogen and phosphorus in the Wekiva River system as part of the Total Maximum Daily Load (TMDL) program. Data from numerous sources, including a 1998-2000 Lyngbya algae study, also funded by FOWR, was used by scientists who helped develop the TMDL criteria for the Wekiva River. These determinations, in turn, set the stage for other programs aimed at reducing nutrient impacts to the Wekiva River. Receipt of the $4,980 grant will allow FOWR to provide a stipend for a Wekiva River Aquatic Preserve Intern to continue a study of the algae commenced and funded by FOWR in 2017 and to add additional stations in order to more closely replicate the original 1998-2000 study. The results will provide a better opportunity for comparison of recent and past data to determine whether an increase or decrease in algae biomass has occurred. Several key strategies aimed at reducing nutrient inputs to the Wekiva system have been in place for many years. The results of the new algae study made possible by the Grindle Foundation grant, in addition to review of water quality trend analysis, can help determine whether those strategies are working. Many thanks to the Art and Phyllis Grindle Foundation for its generosity in making this very important work possible !! The Florida Legislature ended its most recent session with a March vote impacting two subjects of keen interest to FOWR members: Florida Forever funding for conservation projects and a vote that will affect the aquifer and water quality. An effort to publicly fund conservation projects in Florida began more than 30 years ago when Governor Bob Martinez established the Commission on the Future of Florida’s Environment. The Commission held meetings around the State attended by citizens from all walks of life, and state agencies identified lands through this process that they saw as critical to acquire. Floridians made it clear they wanted to protect their environmental future by acquiring these “must have” properties, and the Commission decided to ask the Florida Legislature for a total of $3 billion funded over 10 years at $300 million per year in order to ensure the ecological health and open space needs of the state. A program named “Preservation 2000” was originally approved by the Legislature in 1990 with funding sourced from a small percentage of the money collected from documentary stamps paid on real estate transactions recorded in the public records around the state. The successor to the program was named “Florida Forever,” created in 2001 with another $3 billion approved for conservation funding over a 10 year period also funded from the documentary stamp fee. With approximately 10 million acres managed for conservation in Florida, more than 2.5 million acres of land have been purchased for conservation and recreation use under the Preservation 2000 and Florida Forever programs. When Florida Forever funding is appropriated by the Legislature, it is distributed by the Department of Environmental Protection to a number of state agencies and programs to purchase public lands in the form of forests, parks, trails, wildlife management areas and more. All of these lands are held in trust for the residents of Florida. After the 2008 recession impacted funding, an overwhelming 75% of Florida voters passed Amendment 1 in 2014, which requires that one-third of the documentary taxes collected on real estate documents be used for purchasing and restoring conservation lands through programs like Florida Forever. Despite this clarion call from concerned citizens, Florida’s legislators consistently refused over the ensuing years to fund the program in the intended manner, instead siphoning off funds to pay for existing environmental programs previously paid for out of general revenue, and falling far short of the intended allocation for the purchase of conservation lands. In 2015, for example, the Land Acquisition Trust Fund collected more than $740 million. Lawmakers spent only $88 million of that sum on conservation efforts. In the 2016-2017 fiscal year, only $15 million was allocated to Florida Forever, a huge drop off from the $300 million annual budget received at its peak, and the amount allocated last year was zero. Panhandle. Irrespective of the Legislature’s vote, the lawsuit filed by the coalition is set for a trial in July of this year. Meanwhile, the Legislature also approved HB 1149 in the same legislative session, which would encourage pumping treated sewage into the state’s aquifer to offset increased withdrawals of freshwater. By injecting the effluent, the state could continue approving new water-use permits for developers as new residents continue flooding into the state. We hope you’ll join some of our events soon. Check out our listing and stay tuned to our website and Facebook page for more details.